Introducing my new Craftsy class, Start Paper Piecing! Drumroll, please! It's finally time to share my newest Craftsy class, Start Paper Piecing! If you've followed my blog for more than five minutes, then you probably know how much I adore paper piecing. It's hands down my favorite kind of piecing, and one of my favorite topics to teach. Learning a new technique can be a daunting experience, but with this class, I'm right there with you, on demand, to help you build your paper piecing confidence! Most of the blocks I sew these days are paper pieced, and I love to share my tips and tricks for making the technique as simple as possible. Start Paper Piecing walks you through a total of seven different paper pieced blocks, ranging from some interesting angled blocks to a few star blocks and even some pictorial blocks. There's a wide variety, and there's me to hold your hand the entire way. I'll tell you about how I fell in love with paper piecing, and give you all the information you need to get started with paper piecing! If you haven't checked out Craftsy before, let me tell you, you can learn just about anything there. Seriously, they have such a wild variety of classes! Want to prepare a new dessert for your Thanksgiving dinner next week? No worries, Craftsy has you covered with their Sweet & Simple: 10 Classic Desserts class with Nick Malgieri. Are you interested in trying out garment sewing? Let Deborah Moebes help you with her Design & Sew an A Line Skirt class. 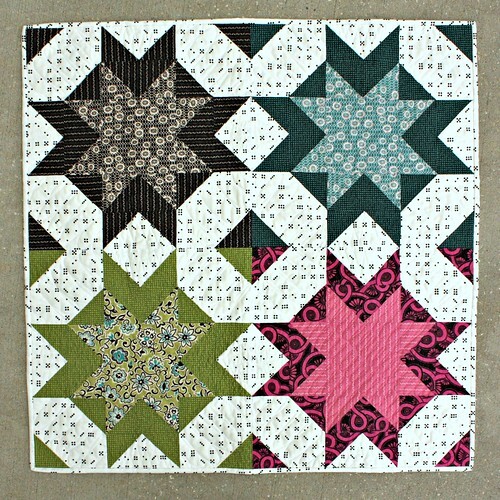 Itching to make some quilts for the holidays? 3 Blocks 30 Quilts with Kate Colleran has some great setting ideas that will get your creative juices positively flowing. I'm itching to check out the Design It, Stitch It Hand Embroidery class with Jessica Marquez, which looks super fun, but I think you get my point - they really have something for just everyone. The best part is that whenever you purchase a Craftsy class, it's yours to watch as many times as you want, to rewind and fast forward as you please, and to ask as many questions as you want - that's been one of the most fun parts about my first class, Start Free-Motion Quilting! I love getting to interact with other quilters. So what are you waiting for? Jump in and fall in love with paper piecing! Get a $20 discount on your class registration when you click right here to register. Have a super day! 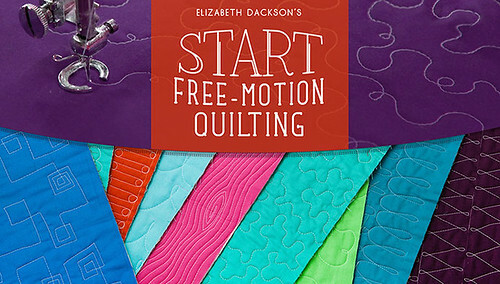 Start Free-Motion Quilting - My Craftsy Class!! 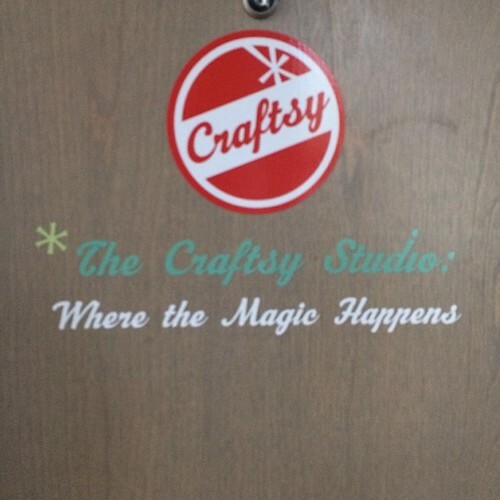 The day is finally here - my Craftsy class is officially up and running! Start Free-Motion Quilting is my first class with the wonderful folks at Craftsy, and this class is perfect for you if you're just getting started with free-motion quilting, or if you've done it before and run into trouble, or if you've done it before and just haven't fallen in love with it. 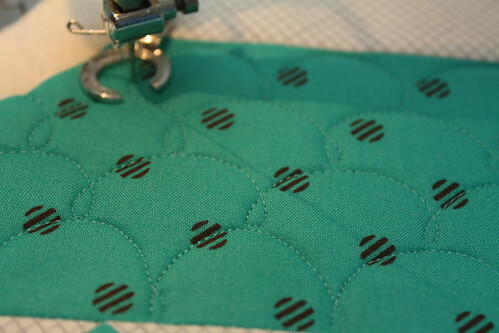 Trust me, my love for free-motion quilting is contagious! 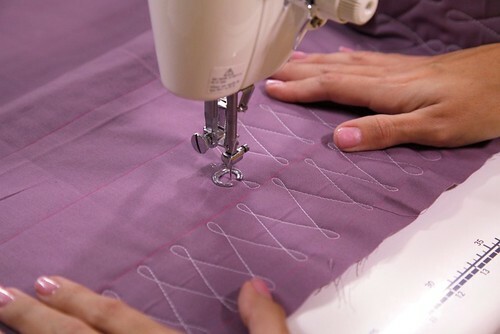 In my class, you'll not only learn about the necessary tools of free motion quilting, but you'll also learn how to handle many of the common problems that can happen when you free motion quilt, from skipped stitched to crazy stitch lengths. I also walk you through ten different free motion quilting stitches that I come back to again and again, that can be used in many different ways, and all of which are super beginner friendly. There are also three patterns included with the class, two pillow patterns and a baby quilt. 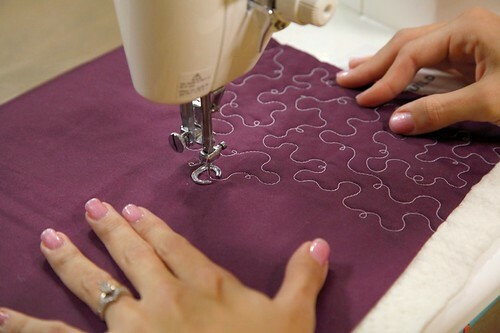 You'll also find a great Getting Started checklist and a Troubleshooting Checklist in the class materials, to keep near your machine to help you as you're getting started free-motion quilting. Today, I want to share with you about the baby quilt pattern found in the class materials, the Superstar quilt. 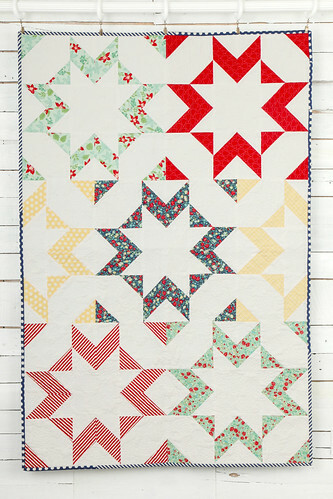 For the class, I sewed up a Superstar quilt in Bonnie & Camille's April Showers prints. Super light and fun, perfect for a new baby. Have you taken a Craftsy class before? I'm big on learning new things, so I love Craftsy. I love being able to learn about what I want to learn about, when I have time to learn it. And oh my goodness, they've got a class for everything! I just love the wide variety of classes on Craftsy, from creative photography to croissant making, from chocolate cakes to improv piecing, from dressmaking to cake decorating, they've really got it all. And now they've got me, too, and I'm so very excited to be working with them. It was a blast to put this class together and I cannot wait to hear what you think of it! To save on your Start Free Motion Quilting class registration, click here and you can start watching right away! Oh, it feels good to be home! My sewing machine, sadly, is not yet back from my trip to Denver, but it's supposed to arrive tomorrow, so I'm looking forward to that. I had a great visit with my family, got to see my son play with his cousins on my side of the family for the first time, got to see some snow, and I-sort-of-filmed-a-class-with-Craftsy. Yep, that's why I was in Denver, and I have to say I cannot wait until I can share more about my experience with the fantastic people at Craftsy and more about my class, but for now all I can say is that I had a great time and the class is going to be awesome. I know, such a tease!! I got to visit the adorable and beautiful Fancy Tiger Crafts shop while in town, which was awfully fun. My niece has her first sewing machine and is learning to sew, so it was great fun to introduce her to a real craft store, and teach her a bit about fabric. She picked out two beautiful Japanese fabrics to add to her growing stash, which I was more than happy to treat her to, and I found a few pieces of fabric I couldn't live without to add to my stash, too, so everyone left happy. Even my older brother, who's an amazing artist, had a great time in the craft store, having discovered knitting diagrams for the first time and appreciating the geometric beauty of them. Now that I'm back, I'm back to teaching in full swing! 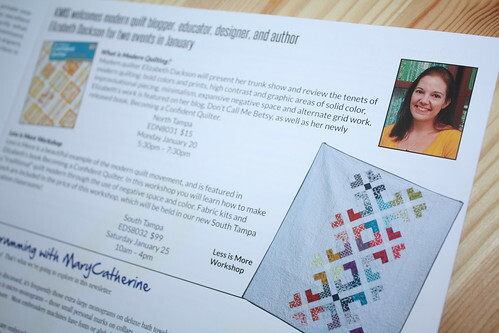 I had a weekend free motion quilting workshop with the fantastic ladies of the Sarasota Modern Quilt Guild. I was super excited to discover that one of my favorite food bloggers just happened to be there in the workshop, which turned me into a total fangirl for a few minutes! If you haven't checked out Jaden Hair's Steamy Kitchen blog or cookbooks and you enjoy Asian food, you simply must click over and check her out. Her recipes are so approachable and easy, not to mention tasty, and she is so sweet in person! 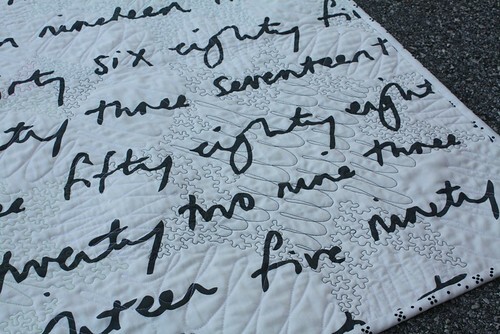 Tonight I'm giving my What is Modern Quilting lecture at the North location of Keep Me In Stitches on N Dale Mabry. If you're in the Tampa area, I believe there are a few tickets still available - you can call the shop at 813-908-3889 to reserve a spot. I've also got a quilt workshop at the South location of Keep Me In Stitches coming up this Saturday, so plenty of chances to come sew with me! Don't forget you can always check my Class Schedule page to find out about my upcoming classes, there's quite a few of them coming up!